Everyone looks forward to summer vacations. A much-needed break from the day-to-day grind and a time to get away with family is important. However, a road-trip with said family can sometimes be… exhausting. Not to mention stressful. Parents know exactly what I mean. Especially moms. It’s up to moms to get everything packed and ready for vacations usually, so we’re tired before we even get started. You pack up your family for a long drive in an enclosed space and there’s bound to be some tension. If you have more than one child, I’m sure you’ve experienced the bickering from the backseat. Kids get bored and bored kids equal bickering. I remember road-trips with my siblings and they could be excruciating. It’s the reason I decided to have an only child. I’m kidding. Well, it’s not the main reason, anyway. Even with one child, road-trips can be stressful. My son may not have siblings to bicker with, but he doesn’t have a sibling to entertain himself with either. With only one child YOU (the parent) have to entertain your child. We’ve found that by entertaining our son or just participating in the fun we have on road-trips, the time actually goes by so much faster. It’s a win-win. In fact, road-trips have become a lot of fun over the last few years for us. Especially when we go on summer vacations. 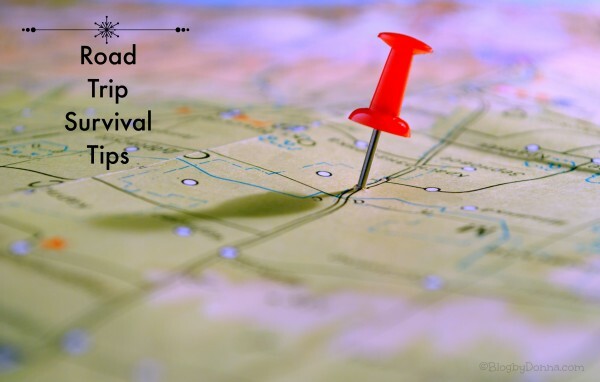 I’ll share with you our tips on surviving road-trips and hopefully your next road-trip will be as enjoyable as ours are to us. Although we would have an even more pleasurable road-trip if we had the 2016 Chevrolet Traverse, the ultimate vehicle for busy moms like me. It’s everyone’s personal preference, but music is a MUST on a road-trip. I can’t drive 5 miles without music, so I couldn’t even imagine a long drive in a car without music. We have sing-alongs and we each get a chance to listen to our favorite radio stations, all family-friendly, of course. My son’s favorite stations are ones that play pop music and I like to listen to stations that play – 80s music. You got to love the music from the 80s, some of it is cheesy, but so much fun. We do allow him to use headphones from time to time, since there are times when you may just need to relax or be quiet. We play a lot of music-related games, too. I’ll share those under games…. Games to play in the car are so easy to find. You can buy games that are specifically for playing in the car. Our son has a trivia card game that we play on road-trips, sometimes. The kids and other passengers in the vehicle can, thanks to today’s technology, play games on their tablets and smartphones. Or, like us, you can play games that are free. The best part: You can be creative and make up games as you go. We play the alphabet game, where someone chooses a topic (food, movie, famous person, etc.) and everyone has to say something that starts with that letter of the alphabet. If I start, I get the letter “A” and would say, “Apple,” for example. As I mentioned above, we also love to play games revolving around music. Like, “Name that Song.” When the next song comes on the radio, the first person to correctly name the song, wins. There really are no limits to the types of car games you can play on a road-trip. Wishing we had a Chevrolet Traverse for all our adventures. Be sure to pack snacks and water. Things that are easy to eat and satisfying are perfect, because hungry travelers are grumpy travelers. I wouldn’t recommend fruit or chocolate, since both can be messy. You also don’t want foods that would hype up your kids. There’s nothing worse than being on a long road-trip and then getting lost. To be fair, no one is ever REALLY lost driving, you’re just temporarily misplaced, but after driving for hours you’re ready to reach your destination. You sure don’t want to have to spend any more time driving around than you have to, right? 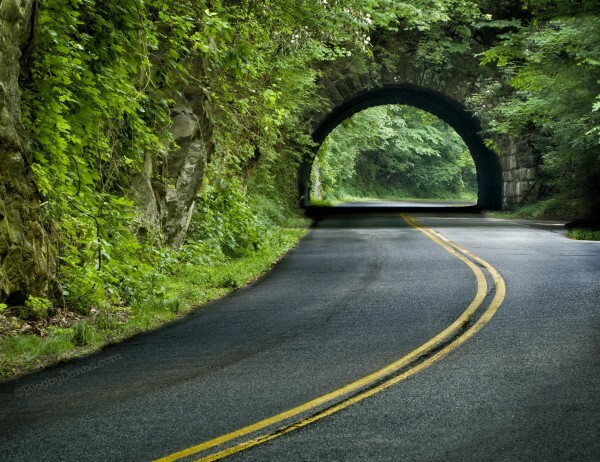 To keep yourself on the right road, be sure to have a GPS or like us, a smartphone. I think most, if not all, smartphones have a built-in navigation system nowadays. As you go on your summer vacations and road trips this summer, I hope these tips will make your life a bit easier and that your next road-trip can be a fun-filled bonding time with your family. We could not survive without games in our car. We just got back from a long road trip and without games and snacks I am pretty sure we might have gone crazy! We took a road trip a few weeks ago. I definitely could have used your tips! We recently rented a Malibu and I fell in love! The car was perfect for road trips with the great music and space. Wipes, snacks, and games are absolutely required on a road trip. We never leave home without them. I love the idea about keeping a first aid kit in your car. You just never know when you will need it. Having snacks is important to keep our family sane on road trips. They really get cranky if they are hungry. That’s true. There is nothing that makes a road trip seem as long as when it’s full of hungry, cranky kids, lol. I wish we had a car so we could take road trips whenever we want! We rely on subways and streetcars which is much much cheaper and more convenient for us but isn’t always ideal! Lots of water and plenty of snacks got the tween and I through our most recent road trip. 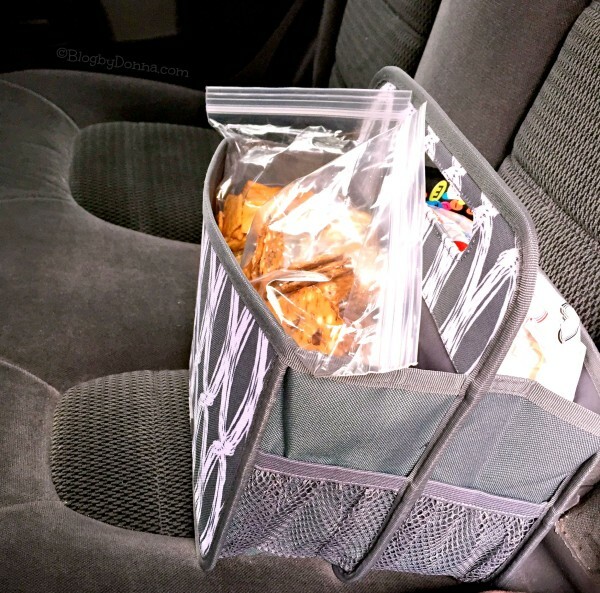 We also use purse organizers for in door organizers for road trip supplies. These are great tips. We always have lots of snacks and games when we go on road trips. How did we survive road trips as children? I have such fond memories of them, but they couldn’t be nearly as much fun as road trips today. These are all great ideas. I always grab a new music album off of iTunes before we hit the road. Talk about perfect timing, we leave on our family vacation in just four days. I plan to take along an overabundance of snacks and an entire case of water along with the kids tablets, the portable DVD player, books and travel games! These are such great ideas that I’ll use on our road trip in September. I am counting down, but at the same time, it is a lot of work to prepare. These are great road trip tips!! I love to have good snacks and music in the car while we travel. GPS is fine but I HIGHLY recommend an atlas, as well. We took lots of road trips when I was a kid and I held that thing in my lap. It helped me learn how to read a map, geography, the interstate system. It helped me learn to figure out when we’d get there by average speed and distance. That’s definitely a good idea. We’ve gotten disoriented even with GPS before. These are all things I need on road trips. I wouldn’t go anywhere without music and snacks! Great tips. I always allow snacks I wouldn’t normally allow to make it fun. I also give new coloring books to keep them busy 🙂 Thanks for sharing your ideas. Games were always a good idea for us. The kids were happy to play road games as well as their Gameboys. All good ideas. I remember road trips growing up. I love to go on road trips. I always pack lots of snacks and a few games the kids can play. Good music is so important for road trips. I always bring games and snacks for the kids. Snacks are a must for trips. Games would be great too. We just went on a road trip with our small girls and these tips are what saved us from losing our minds. The actual road trip was just as fun as Disneyland. Yes to all of the above. Especially with kids in the car. If we’ve got snacks and music, we’re good. A few games and books – even better. We still road trip at night while they sleep! Too nervous to try during the day! I remember the road trips that I use to take when I was little. My sister and I were given lots of great books, colouring materials, games, and other stuff…no, no electronics back then! But, we always had a blast in the back seat…as long as we weren’t driving for more than 3 or 4 hours! Then we would get on each others’ nerves!!! I agree with map. And I’d like to add money. Without money, one can survive nothing. Awesome tips! I always keep cash on hand just in case. Extra charged phone batteries and tons of snacks in a cooler just to be on the safe side. I do a lot of preplanning and preparing for our trips. Making sure our cars are ready to go and stocked with the necessities. These are fantastic tips! I love the snacks one. It is imperative that we are all well fed while driving and riding. Look my motto for roadtrip survival is snacks and apps! Thats really the solution especially for long road trips snacks and apps! I am not a mom…but still remember when I was younger, how much work she put into the trip…even before it started! No wonder she usually fell asleep in the car on the way to the cottage!!! These are all such great tips, I always pack up the tablet, some paper, crayons, pencils and as many snacks and water as I can … to keep the three kids occupied and fight free. We always keep a first aid kit in the car. I can’t tell you how life saving that’s been on a road trip for our family! Definitely need to remember this post whenever I go on the next family vaca! These are fabulous tips! Will definitely be keeping these down.